Jazz, one of the largest cellular networks in Pakistan offers one of the fastest and most reliable 3G/LTE internet connection. 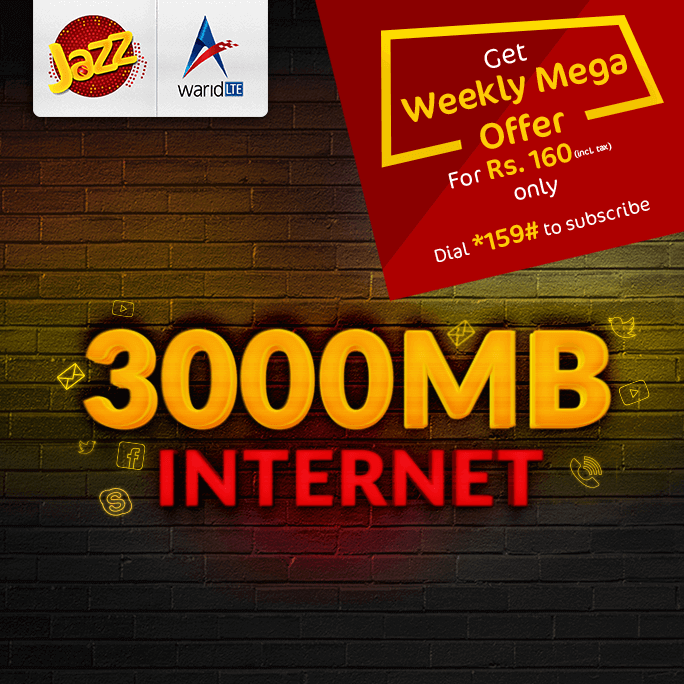 As the number of consumers starting to utilize 3G and 4G internet is swelling every day, Jazz has come up with yet another amazing Internet bundle. Their new ‘Weekly Mega Bundle’ offers 3000 MB of high speed 3G and 4G internet, at just Rs.160 (inclusive of all applicable taxes). This offer is the most suitable for light to moderate Internet users. Jazz weekly mega offer can be subscribed by dialing *159# for Rs.160 (inclusive taxes) and has a validity of 1 week (7 Days). To check the amount of remaining Internet MBs, you can dial *159*2# in order to ensure that you won’t go over the limit. Any additional usage would be charged at Rs.1/MB. Moreover, this offer is non-recursive and you’ll have to dial the code again manually if you wish to subscribe to it again.